In Florida, when it rains, it pours. Water erosion can slowly wash away soil from underneath your driveway, leading to unstable soil compaction, and concrete that is sinking and cracking. This is why you may notice that when it does rain, sand builds up at the end of your driveway. Or maybe you have noticed that your driveway has become bumpy when driving over it. Hollow sounds or voids along the edge of your driveway are also telltale signs that the concrete is becoming unstable. Having sections of concrete removed and then replaced with new concrete can be very costly, not to mention the new concrete will not match. Not only is replacing concrete expensive, it is also loud, messy, and it can take up to 30 days to be completely accessible to drive on. Using our state of the art equipment and NSF approved polyurethane foam, we have the ability to replace the washed away soils by compacting, re-leveling, and filling voids. By having your concrete re-leveled, as opposed to replaced, all sections of concrete will be uniform in not only color but in texture as well. 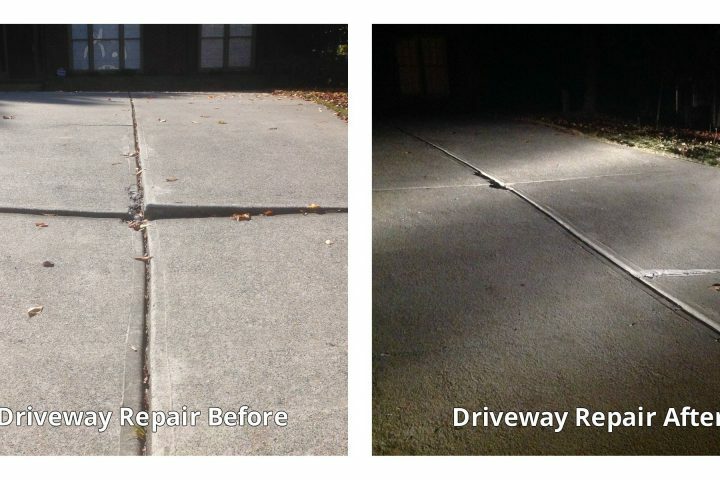 Most repairs can be performed within a few short hours, allowing you to use your driveway as soon as the job is completed. With our work there is no down time, no mess, no noise, and no disturbance whatsoever to any landscaping. With these reasons, along with the low cost comparison we believe that our foam is your solution! We also pressure wash concrete and restore pavers. Bring your pavers back to life, please contact us for a FREE estimate!